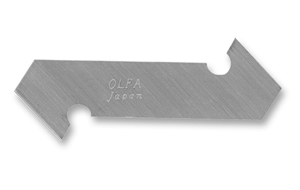 OLFA Blades PB-800 Model 5014 are plastic/laminate heavy duty replacement blades. High quality tungsten blades provide precision score lines for accuracy and efficiency. 2 cutting edges per blade. 3 blades per pack for 6 cutting edges. Fits both the P-800 and PC-L heavy duty plastic/laminate cutters. A great blade for cutting plastics and laminates for both construction and industrial applications.